Almost makes me wish for some sort of x-ray vision to go Dungeon and Lapus Lazuli hunting. If you’re interesting in mods there’s at least one I know of that will do that. Yup. There’s one that’ll put an overlay on your screen (single player only, I believe) that allows you x-ray vision. There’s others that will give you survey maps for different minerals. It feels a little cheaty to me so I’ve only played with them a little bit, but there’s a wide variety of mods over at http://minecraftforum.net. hehe, yeah those holes in the map confuse the hell out of me. not sure just why they’re happening so often. I’m not sure why either, it might be the SimpleServer wrapper I’m using for security. Once the hMod replacement Bukkit becomes available I’ll switch over and give it a try and see. Still, the holes aren’t occuring that often (at least in my experience). 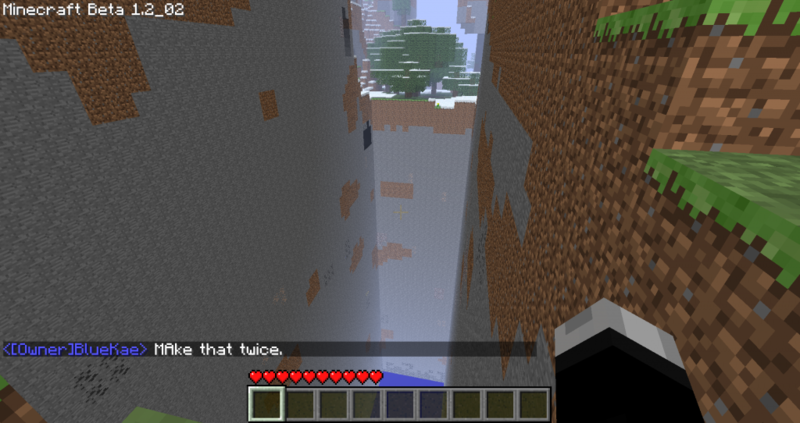 I’ve been playing quite a bit on the adventure server the last two weeks and have only seen holes twice.